The tick-borne bacterial disease anaplasmosis is gaining ground on Lyme disease. Here, we identify the symptoms and offer treatment and prevention tips. Most healthy individuals recover fully from anaplasmosis with treatment. Older people can be at a high risk of more serious effects. Ticks are nasty bugs that transmit a number of diseases, among them anaplasmosis. What is anaplasmosis? It’s caused by the bacteria Anaplasma phagocytophilum, which the tick shares when it bites a host. Anaplasmosis is the second-most common tick disease, after Lyme disease. While the incidence of Lyme disease dwarfs that of anaplasmosis (30,000 Lyme cases to 4,461 anaplasmosis), the Centers for Disease Control and Prevention (CDC) states that anaplasmosis is on a rapid incline, from 348 reported cases in 2000 to 4,415 reported cases in 2016. Anaplasmosis affects not only humans, but dogs, cats, horses, cattle, and sheep. Anaplasmosis symptoms usually appear one to two weeks after a tick bite. A rash can occur with anaplasmosis, but it’s often a signal that another pathogen is at work as well, such as Lyme disease. If you discover a tick bite on your body, be alert to the symptoms of anaplasmosis, as described here. 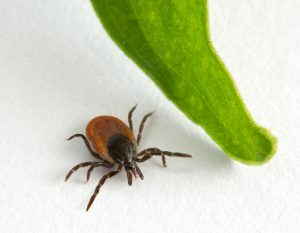 Because these symptoms are general and overlap so many other diseases, physicians often make an anaplasmosis diagnosis based on assumption, as in evidence or knowledge of a tick bite or being in a tick-infested area. Blood tests can’t pinpoint the bacteria, as they won’t show up for seven to 10 days. However, a complete blood count and a liver function panel could show low platelet counts, low white blood cell counts, and/or elevated liver enzyme levels, which would be used as additional signs of possible anaplasmosis. Most healthy individuals recover fully from anaplasmosis with treatment. Older people, though, can be at a high risk of more serious effects. 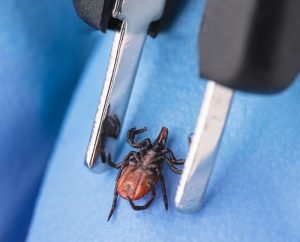 Although the Centers for Disease Control and Prevention state that only 1 percent of anaplasmosis cases become fatal, it’s a sobering thought—and impetus to get to the doctor immediately if you’ve been bitten by a tick and start experiencing the symptoms described in this post. Doxycyline is usually prescribed based on symptoms of a tick-borne disease like anaplasmosis. The sooner the course of antibiotics is started, the better in getting rid of the illness. Doxycline belongs to the tetracyline group of antibiotics, which are effective on bacterial infections like anaplasmosis and Lyme disease. Some people have trouble taking doxycline for anaplasmosis or any other bacterial infection. Among the drug’s side effects are a loss of appetite, nausea, and vomiting. If you cannot keep the pill down, report that immediately to your physician, because you won’t get any benefits. Mild side effects from the drug may go away within a week or so if you can tolerate them, but serious side effects—bloody diarrhea, cramping, headaches, vision problems—should be reported to your doctor immediately, according to Healthline.com. A view of a tick’s underside; note the mouth parts, through which a tick passes along such diseases as anaplasmosis and Lyme. Ticks can’t jump or fly, whether they’re carrying anaplasmosis or any other disease. They hold onto a blade of grass, waiting transfer to a host who is close enough to crawl onto. Once they are aboard, they walk around, looking for a place with thinner skin and, usually, hair. Ticks are often found on the head, pubic hair, armpit, ears, bellybutton, and back of the knees. According to the CDC, they begin to feed 10 minutes to 24 hours after landing on a host. This timing is critical. While many sites say it takes 24 to 48 hours for the transmission of a disease like anaplasmosis to occur, some experts have cited timelines as low as a few hours. One thing is clear: Once the tick begins to feed, it can transfer disease. Any stage of a tick’s life may be capable of transferring diseases like anaplasmosis. “Most ticks go through four life stages: egg, six-legged larva, eight-legged nymph, and adult. After hatching from the eggs, ticks must eat blood at every stage to survive,” says the CDC. Although your dogs, cats, horses, and other animals can also contract anaplasmosis from a tick bite, anaplasmosis is not contagious. It is only transferred by that bug bite. Therefore, preventing anaplasmosis involves reducing your chance of picking up a tick. Know that ticks hide mainly in tall grass and brushy, wooded areas, but they are not confined to the woods. You may find a tick in your own garden. Spray permethrin (0.5%) on clothing and gear (it may remain protective through several washings, says the CDC). You can also purchase permethrin-containing clothing. Brands include ElimiTick, BugBeWear, InsectShield, Duluth Trading, LL Bean, ExOfficio, and Sawyer. 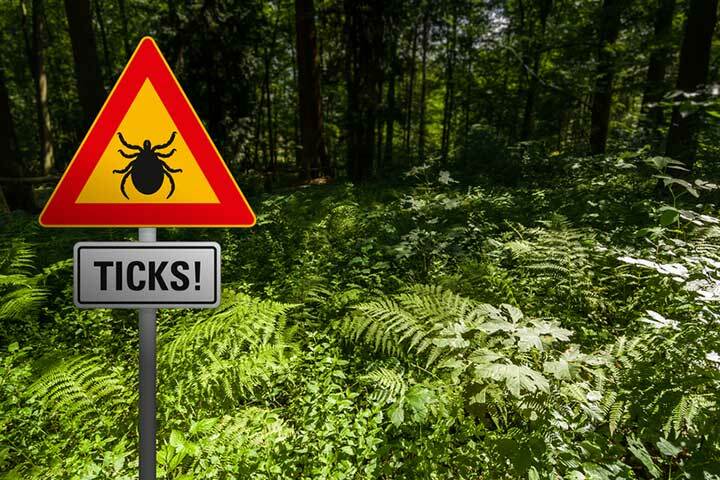 The University of Rhode Island conducted a controlled study to compare tick bites on people wearing permethrin-treated clothing vs. regular summer clothing, like T-shirts and shorts. They placed blacklegged ticks on 15 (very brave) volunteers. The results after the two-day trial confirmed that permethrin-treated, military-weight clothing was most effective against tick bites (dead ticks were found under some of these clothing) and that summer-weight non-treated clothing had the highest potential for tick-borne pathogen transmission. Additional repellents that are effective include products containing DEET, picaridin, IR3535, oil of lemon eucalyptus (OLE), para-menthane-diol (PMD), and 2-undecanone. The Environmental Protection Agency (EPA) has a website page that can help you choose exactly the right type of repellent for your outing. Southern tick-associated rash illness (STARI) Lone star tick Similar to Lyme, fatigue, headache, fever, muscle pains Southeastern and eastern U.S.
abdominal pain, alcohol, antibiotics, appetite, autism, bacteria, bacterial infection, bloody diarrhea, brain, cancer, chest pain, cognitive impairment, cramping, diarrhea, ears, headaches, health, how to treat a bee sting, infection, inflammation, joint inflammation, joint pain, kidney failure, lyme disease, lyme disease symptoms, memory, memory loss, muscle, muscle aches, muscle pain, pain, pains, pesticides, report, side effects, skin, sore throat, ulcer, virus, vision problems. Our Osteopath found that back pain is stopped by squeezing the Gluteus Maximus muscles. For first month squeeze very often..10Xs per hour! after that, one squeeze will stop back pain (lower back only).